Family and the Peace Corps Master's International Program drew Celia Jackson to the University of Alaska Fairbanks, but a great job with the American Red Cross will keep her here. Jackson grew up in Seattle and earned a bachelor's degree in environmental policy and planning at Western Washington University. She came to UAF's School of Natural Resources two years ago to study natural resources management, having been chosen for the Master's International Program. After receiving notice that her Peace Corps assignment would be Ghana, Jackson injured her back and had to have surgery. "I realized the healing process would take a year," she said. While taking a semester off, she made the difficult decision to postpone Peace Corps service and withdraw from the Master's International Program. 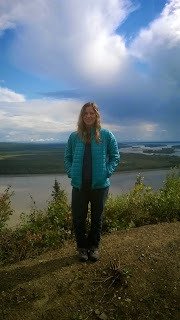 Celia Jackson at the confluence of the Yukon and Tanana Rivers in Tanana, Alaska. "I can join the Peace Corps later," she said stoically. Jackson is finishing her master's degree and hopes to graduate in May. She was a Red Cross volunteer in Seattle, helping fire victims find shelter. She began working for the Red Cross as a part-time disaster specialist, assisting with volunteer management and outreach. Recently she was promoted to disaster program manager and is managing disaster services and volunteers. The area covered includes Fairbanks, the Yukon-Kuskokwim region, the North Slope Borough, the Northwest Arctic Borough, Nome and Valdez. Jackson enjoys partnering with other agencies, planning events and looking out for the safety of Alaskans. And she loves working with volunteers. "They really care about the mission of the Red Cross," she said. "Volunteering is such a powerful thing. It gives you the control to do something positive. Even if your job or your personal life are not going well you can lift yourself up through volunteering." She is especially passionate about disaster preparedness in rural Alaska and in August flew to Tanana to meet with Red Cross volunteers. 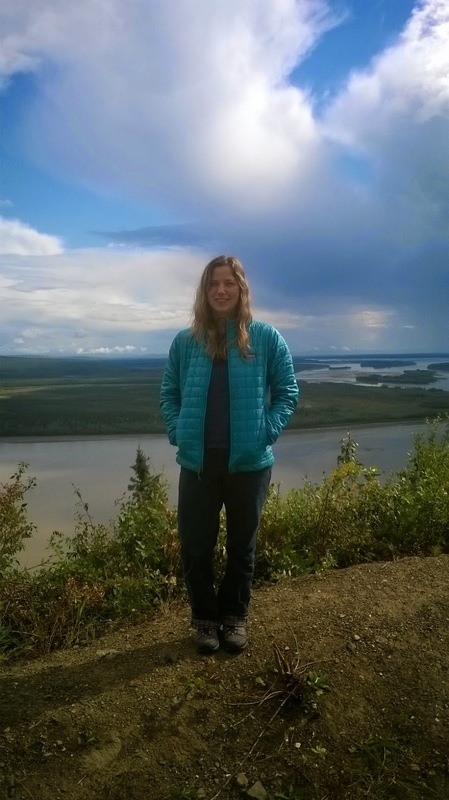 Jackson has been able to incorporate her graduate research with her job, working with volunteers to survey the Yukon-Kuskokwim area to determine disaster readiness She wants to publish preparedness materials targeted to each region. "As far as I can tell, that has never been done," she said. "I want to grow this program in the villages. "I'm lucky this fell into my lap. This is a great research project; it's relevant and timely." Working in disaster readiness take flexibility, Jackson said. "You have to be willing to go with the flow, to change plans at a second's notice. And you have to smile and laugh and keep a positive attitude." Ironically, Peace Corps service and working for the Red Cross require some of the same skills and mindsets, Jackson said. "You live or die by your attitude." She is glad she came to UAF. "It is a safe and friendly place to get acquainted with Alaska," she said. Jackson enjoys the camaraderie with Peace Corps students in the natural resources management program. "They provide a network of friends even though I didn't go into the Peace Corps." Anyone interested in volunteering with the Red Cross is welcome to contact Jackson. "The Red Cross is always looking for volunteers," she said. "It would give students professional level volunteerism to add to their resume." When not working or studying, Jackson likes to walk her dog, backpack, ski, climb and read. She is a volunteer EMT and firefighter for Chena-Goldstream Fire Department.